ALICE PUNG was born in Australia in 1981, a month after her family fled from the killing fields of Cambodia. Her father named her Alice because he thought their new home was a Wonderland. She is now a writer and a lawyer. 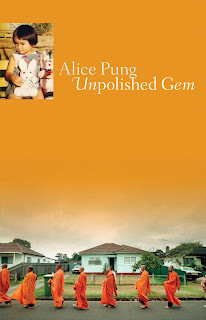 Unpolished Gem is her first book; warm-spirited and wonderfully wise, it is a vibrant, irreverent portrait of an ordinary girl growing up straddling two worlds in a big new country. She is also the editor of Growing Up Asian in Australia, an honest and often-funny collection of accounts by both well-known authors and exciting new voices about what it really is like to grow up Asian in Australia. Since I was 20 I have always worked three jobs simultaneously. I still work three jobs—one full-time and two part-time, but I don’t feel stressed out because this is everything I have always wanted to do—practice law, be a writer and teach students. My father is a survivor of Pol Pot’s Killing Fields and my mother was a child worker at 13, and so there was no chance of me ever being able to sit still for ten minutes without feeling infinitely guilty about bumming around doing nothing! When I was younger, I did not yet know how to deal with the seemingly unending plagues of head lice and scabies I used to get, or with looking after baby siblings while my parents both worked, or with feeling trapped in a Betty Freidanesque sort of domestic nightmare. I had such low self-esteem, I needed to feel like a winner at something. So at 13, I began a Guinness Book of Records, where I made myself the world record holder in all the following categories: ‘Record for the person who has pilfered every single hairstyle Ronald McDonald has had for the past ten years’ (mum made me get a perm to burn off all the head-lice eggs), ‘Record for the best ironing-board impersonation’ (I was consummately flat-chested), and ‘Record for the ugliest face in the history of the universe’. I looked back over my journals when I was eighteen and found them rather hilarious, even though they were unintentionally so. And that was when I decided that I would write a funny book. I was tired of reading manuals by Asian women on how to feel miserable and oppressed. Young girls—particularly Southeast Asian girls—are socialised not to vocalise any form of anger or annoyance. And girls are not supposed to make fun of themselves because it is meant to do some sort of irrevocable damage to their brittle self-esteem. However, it seemed that Asian women could write countless books on their ten thousand sorrows, and be published, as long as the misery came from the forces of the outside world. I was tired of reading Oriental Cinderella stories and migrant narratives of success. Instead of inspiring me, they actually made me feel like an abject failure. When will I ever accumulate enough suffering to be a real writer? I wondered. I had defeated no communists, nationalists or evil stepmothers, nor did I have a seedy past or narcotic addiction, and the only thing I had ever smoked was salmon (in the oven). Then I thought, I wonder what would happen if I wrote the migrant narrative with a distinctly Australian voice, and a sense of humour? And so Unpolished Gem was begun, a book that was premised on poking fun at my abysmally low, adolescent sense of self; and a book about my love for my quirky, daggy family. A book where even the only romance I had ever had during my coming-of-age didn’t even work out! Was it difficult getting your memoir, Unpolished Gem, published? Did you experience difficulty in finding an agent or a publisher for your first book? What about your second book, Growing Up Asian in Australia, a collection of real-life stories about Asian Australians? 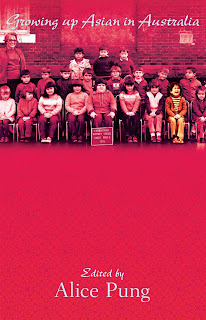 I was very lucky to have an editor at Black Inc. who expressed interest in Unpolished Gem very early on; and then that same editor, Chris Feik, suggested that I edit a collection of short stories about growing up Asian in Australia, and that was how Growing Up Asian in Australia came about. Which do you enjoy more: fiction or nonfiction? And why? Asking this question to a writer is akin to asking someone whether they enjoy dinner more than dessert, and making them choose between assuaging a hunger or gratifying a desire. Both are important to experiencing life in its fullness. Some people think that nonfiction and fiction are entirely separate spheres, that one is about the real world, and the other about a made-up world. But the Talmud says that “we do not see things as they are, we see things as we are.” So all worlds are made up, in our heads. I enjoy watching the world inside my head—whether that’s called fiction or nonfiction is irrelevant. So I enjoy writing about both. And naturally, I enjoy reading both, too. I read lots of John Marsden (Australian young adult writer), Paul Zindel (Canadian), and Lois Lowry as I was growing up. I adored John Marsden for dealing with the difficult and dark feelings of adolescence, and I loved Paul Zindel and Lois Lowry for the humour they imbue in their stories. I loved Amy Tan because she told stories I could relate to. But I also read voraciously and indiscriminately because no one ever censored my reading. The funny thing is that no one ever judges another person for watching a series of ‘bad’ films, yet if you continue to read ‘bad’ books you are meant to have poor taste, and it is supposed to reflect on your personality. When I was fourteen I thought the Dolly fiction and the Babysitters Club was literature. Looking back, I am still very fond of Anne M. Martin. Those books never did me any harm. In fact, they did me a lot of good. I usually have three books going on at once—a fiction, a nonfiction, and a ‘wildcard book.’ At the moment I am reading Barbara Ehrenreich’s Nickel and Dimed: On (Not) Getting By in America which is a nonfiction book about a journalist who spent a year working in minimum-wage jobs in America—as this is the area of law in which I practise (I am also a lawyer); a fictional book called The Slap by an Australian writer named Christos Tsiolkas about the consequences when a man slaps a boy who is not his son at a barbeque, and Susan Sontag’s Regarding the Pain of Others. This last one is an essay about how we react to images of war and torture. Tell me a bit about Unpolished Gem. What are some of the themes you dealt with in it? What about Growing Up Asian in Australia? The title Unpolished Gem is derived from an old Chinese Cambodian saying: “A girl is like cotton wool—once she’s dirtied, she can never be clean again. A boy is like a gem—the more you polish it, the brighter it shines.” When I talk to school students about my book, all the girls understand this, because even now we live in a world where Paris Hilton (who is the same age as me) is hailed as a role model. But a lot of the boys still think that the reference to ‘polishing a gem’ is about wanking. Growing Up Asian in Australia is a collection of stories I edited—a total of 62—from famous and not-so-famous Asian Australians, about—well, growing up Asian in Australia. Try as I might to rack my atrophied little brain for a more interesting title, I could not come up with anything that was neither ridiculous nor racist. We are the country that implemented the White Australia policy for 75 years of the last century, and called early Asian Australians the Yellow Peril. I could not risk a wisecracking smart-derrière title that would have belittled the discrimination of Asian Australians who grew up and lived under this policy. What was the editorial process like for both your books? My editors at Black Inc. are the best editors in the world. Chris and Denise O’Dea really know how to see the big picture of a manuscript, and give me as much artistic freedom as I need. Above all, Chris is patient—because Unpolished Gem took me three and a half years to write. I have never been a full-time writer, and I have always fitted my writing around my life. I don’t believe in living the life of a tormented artist. I don’t like making others around me miserable with delusions of grandeur. So I write only when I have something to say, and once I have said it, it’s okay. That is why I was never particularly sensitive when we decided to pull out whole chapters of my manuscript. The only thing I am sensitive about are the covers of my books, because I know how much a cover can influence the reader. When I edited Growing Up Asian in Australia, I learned how important it was to see each submission as its own entity. Because in the end, after reading over 200 submissions, I had to decide on choosing one writer’s ‘personal journey’ over another. Being a writer myself, I know how much all of these contributors had put themselves on the line. But being an editor, I learned to see which stories really emerged with distinct and unmistakable voices, and which others might not have worked so well. I read decisions about minimum-wage workers and wages for employees with disability. My ‘break’ from writing is my full-time day job, thankfully one I love. Do you read short stories? Do you have a favourite short story or short-story collection? Do you think short stories are gaining more popularity? I love short stories. They are gaining more popularity as our lives are becoming more fast-paced, and people find they don’t have the long stretches of time to read novels. A short story is an efficient and complete world in itself. Do you write short stories? If so, where have you published them? All my stories begin as short stories that I just weave together to make into books. I have had them published in Meanjin, Etchings and The Best Australian Stories 2007. Tell them that late at night in bed, when they are exhausted after a day’s work, a short story is the literary equivalent of a one-night stand. They will end up feeling frustrated about their memory/age/state-of-their-stressful-banal-lives if they can’t remember what happens to certain characters in novels the next night. But a short story on the other hand, is the little temporary pleasure that does not demand you commit to memory all the peripheral details of its existence. It’s just there for you to dip into and delve out of, without any preconceived expectations. That is true. But imagination helps you come up with some pretty damn inventive ones, too, since I have never had a one-night stand before so would have no idea whether it is true that a short story is its literary equivalent. “Good books don’t answer questions, but they give us questions to enjoy for a long time.” What about this quote? Actually, I read quite a few good books that answered some really significant questions for me. My favourite is one called Who Ordered this Truckload of Dung?. What do you think are the differences between writing short stories and full-length novels? Which form do you prefer working on? I like writing both short stories and full-length novels. Unpolished Gem began as a collection of short stories before Chris told me to weave some sort of consistent narrative to them! There has always been, and there will always be good writers and good writing—the question is whether there will be enough publishers with interests beyond finding out what mainstream tastes are and pandering to commercial interests. Keats did not enter any poetry competition, the Brontë sisters did not write to gain residencies abroad! Good writers write because they have something to say—not to increase recognition. And hopefully the book industry will recognise good writing. This statement is the equivalent of suggesting that making an MTV video clip is training ground for creating a full-scale Andrew Lloyd Webber musical. Just as all genres of music are different, all genres of writing are different. Some short-story writers are actually bad novelists, and vice versa. I don’t like the idea that the short story cannot stand by itself as a legitimate work of fiction, that it must be some sort of practice for the real McCoy: the literary novel. In fact, the screenplays of three of the most well-made films in recent years—Ang Lee’s “Brokeback Mountain” and “Lust, Caution,” and Clint Eastwood’s “Million Dollar Baby”—were based on short stories. A world in which I can get lost, and emerge, and finding a bit more of myself than I realised. Like coming out of a good relationship. Life is beautiful. Despite my earlier diatribe about the White Australia Policy plaguing those of a different ethnicity in our not-so-distant history, my family arrived here at a blessed time, when the government implemented waves of multicultural-affirming policies to rinse out the bitter aftertaste of the Restriction of Immigration Act 1901. So in the late 1970s and early ’80s, my Cambodian Chinese Pol Pot-surviving family members were welcome here. I was born here, and have never experienced racism growing up. I am working on a collection of short stories which will hopefully become my next novel! I just returned from living in China recently, so now I understand what it is like to be like a fish out of water in a foreign country—but above all, I learned how much kindness there is in the world, too. Is it true that Alice Pung won't be going to Ubud 2009? Alice Pung apologizes for not being able to be at the Ubud Writers & Readers Festival 2009 because she has unexpectedly ended up with a writing residency at the Iowa Writers Workshop. She hopes to make it to Ubud one day.